In recent days, multiple reports claimed wildly popular social gamer Zynga was locked in a high stakes game of chicken with Facebook over the social network’s planned virtual currency, Facebook Credits. Even with the two companies’ obvious needs for each other – seven of Facebook’s ten most popular games in April came from Zynga’s portfolio and the majority of Zynga’s revenue sources from Facebook derived users – the chatter was of a possible divorce. 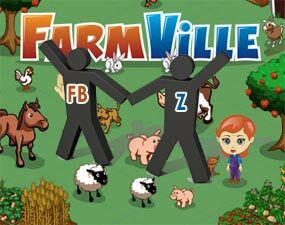 Facebook was reportedly trying to lock Zynga into a long term revenue sharing deal. Possibly exclusivity. Zynga, some reports claimed, was resistant and threatening to bolt, maybe even start a social game network of its own. The fight’s over now. Whatever truth was in the rumors, and whatever was merely negotiating tactics, is now irrelevant. Facebook and Zynga announced that they’ve entered a five year strategic partnership that will “increase their commitment to social gaming on Facebook” and expand the “use of Facebook Credits” to Zynga’s games. Terms weren’t disclosed though the deal appeals to be non-exclusive which would leave Zynga the freedom to broaden its alliances and decrease its dependence on Facebook.